New Lung cancer scanning trucks that operate from supermarket car parks are being rolled out in Hull next year as part of the national drive to save lives by catching the condition early, NHS England announced today. Around £70 million will fund 10 projects that check those most at risk, inviting them for an MOT for their lungs and an on the spot chest scan that include mobile clinics. The targeted screening will help improve survival rates by going first to the some of the areas with the highest death rates from lung cancer. A recent study showed CT screening reduced lung cancer mortality by 26% in Men and between 39% and 61% in women*. The roll out has the potential to reach around 600,000 people over four years, detecting approximately 3,400 cancers and saving hundreds of lives across the country. “Humber, Coast and Vale Cancer Alliance and NHS Hull CCG welcome the announcement that Hull is one of ten initial sites, across the UK, chosen to be part of the first phase of the NHS Lung Health Check roll out. “The CCG and the Alliance are working with Hull University Teaching Hospitals NHS Trust and local health care partners to develop plans for the implementation of the lung health check service in Hull, which will include a mobile lung cancer scanning truck. We envisage that patients will be accessing the service from early 2020. The NHS Long Term Plan set out an ambition that 55,000 more people will survive their cancer – to achieve this the plan also included an ambition to increase the number of cancers diagnosed at stages one and two from half to three-quarters of cancer patients. 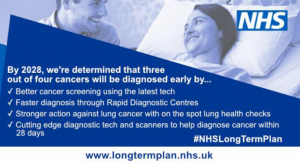 Cally Palmer, national cancer director at NHS England, said: “Catching more cancers early is a cornerstone of the NHS Long Term Plan to save a further 55,000 lives a year and targeted lung health checks is one of the first projects to roll out following publication. NHS is initially extending the programme to ten new areas across the country at a cost of around £70 million over four years. Based on the pioneering schemes in Manchester and Liverpool, the projects will not just identify more cancers quickly but pick up a range of other health conditions including chronic obstructive pulmonary disease (COPD). The scheme means people aged 55-74 who have been identified as being at increased risk of lung cancer will be invited for a lung health check and be offered a chest scan if appropriate – this scan could take place in a mobile unit or in a hospital setting. The new projects will last initially for four years and NHS England will then evaluate the results to use as a basis for further roll out. Most, but not all schemes will use mobile scanning units, this will be dependent on local need – one scheme currently piloting in Liverpool targets clinics in various areas of the city and, where needed, patients are referred to hospital for a scan. Over two years they have they have found and treated more than 40 new cases of lung cancer, with over 75% at an early stage of the disease, when typically 70% of lung cancer cases are not diagnosed until a late stage in Liverpool, when treatment is more difficult.